Let our talented hair stylist and designers give you the Total Look that can only come from the Total Look Company in downtown Monticello, Wisconsin. Established in 1990, and conveniently located in the heart of Green County in beautiful and historic downtown Monticello, Wisconsin. 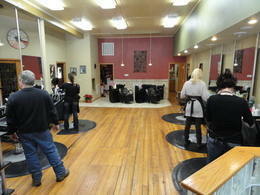 Total Look Company provides the BEST hair and beauty care and total body services in all of Green County, Wisconsin. We specialize in pedicures, manicures, facials, make-up, hair removal and nail extensions.